Today is the fourth day of Navaratri, a Hindu Festival honoring the Divine Shakti. During the fourth through sixth days of Navaratri we honor the Goddess Lakshmi who will bestow us with prosperity, grace and abundance. Within five minutes of doing my meditation with the Insight Timer on my iphone I received a push through notification that I had received a donation from a Namaste Yoga viewer in Switzerland. Not only is it unusual to receive a donation during early-morning meditation hours, but it was also the largest donation that Namaste Yoga has ever received. Jai Lakshmi! During my sadhana for Navaratri I am focussing on connecting with the divine feminine energy and grace of the Goddess. Sally Kempton describes Navaratri as a time of new beginnings and transformation. It is a time when we can deal with our own samskaras and spiritualize our lives. Yogini Shambhavi Chopra recommends chanting Durga mantras during Navratri. The Durga mantra I chose to work with over these nine days is, “Om Hrim Krim Dum Durgayai Swaha” mantra and I wanted to share a little bit about its meaning. Om is the mantra of our higher self that allows us to attune to our true nature and inner guru. By chanting om it helps to open and clear our minds for meditation. It also helps to promote higher prana and inner light. AUM harmonizes our body with Divine presence within and removes negatives emotions. Hrim is the prime mantra of the Goddess and is equivalent to OM for the Goddess. Hrim helps to purify our inner quest so that we can be humble before the Divine allowing her to enter into our hearts. This sound energizes our heart with warmth. Krim is the electric energy of shakti and is a transformative mantra of Kali. When we chant krim it sets Kali’s transformative power in motion within us. Dum is the mantra of Durga. Durga is the protective form of the Divine Mother who guards us from difficulties in our lives. She is said to eliminate our sorrows, obstacles and barrires. Durga grants self-control and self discipline. Durgayai Swaha is an offering to Durga. Svaha is literally a fire consecration mantra. When we do chanting for removing some disease or negativity or to get some thing from god then we use Swaha. With swaha mantra you have to sacrifice something. 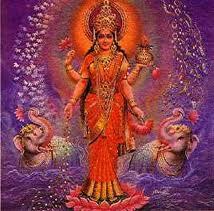 Lakshmi is a loving and nurturing Goddess who offers us health, wealth, beauty, fertility, happiness and abundance. She is particularly helpful with womens’ health (fertility, menstruation, and menopause). Lakshmi is the Goddess of preservation, support and nourishment. She will bless her devotees with abundance in their spiritual life giving them devotion, bliss, and beauty of perception. *Please note all the meanings of the mantra were taken from Pandit Vamadeva Shastri’s (Dr. David Frawley’s) book Mantra Yoga and Primal Sound.